What is Canvas Day? It’s the event you won’t want to miss (really)! 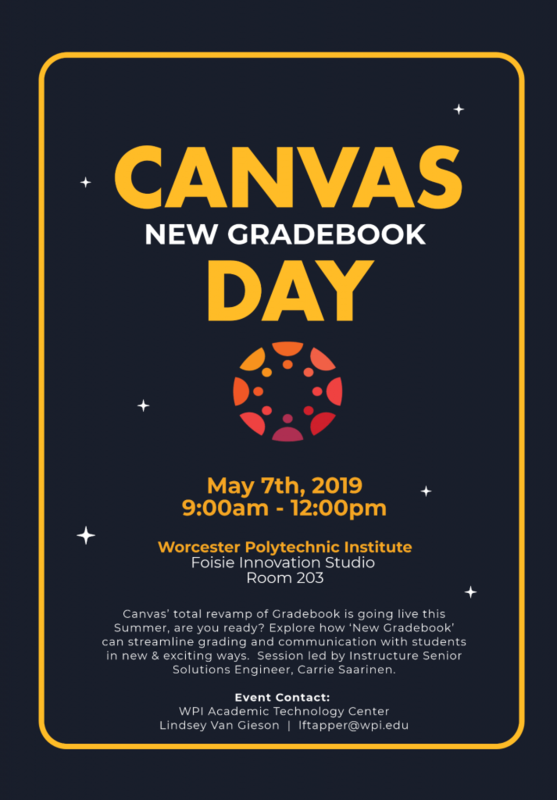 Sponsored in part by the NERCOMP Canvas Community of Practice, Instructure Senior Solutions Engineer, Carrie Saarinen, will be here on campus to discuss all the improvements to Gradebook and we’ll have a chance to ask her questions. Don’t miss out, mark your calendar for May 7th, and please RSVP here! Some highlights of the improvements include: a more modern interface (meaning less clicks! ), addition of new icon and color statuses, and new functionality such as late submission policies. Keep an eye on your email for more opportunities to learn about New Gradebook before it goes live this August. Want to get a head start? Check out these self-service resources or reach out to us to schedule a 1-on-1 training canvashelp@wpi.edu.